While pondering how to increase the light available from a single BC lampholder I realised that with the low(ish) temperature and low current requirement of compact fluorescent lamps, it would be perfectly feasible to make an adaptor to allow the use of several such lamps in a single lamp holder. Unfortunately I then proceeded to produce a sputnik-like device with the equivalent optical output of a small atomic bomb. 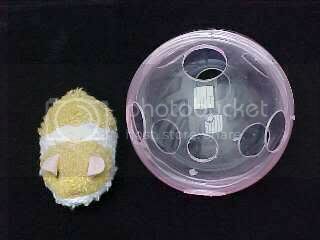 Here's a little motorised hamster and his roly ball, what fun.... For about a minute! 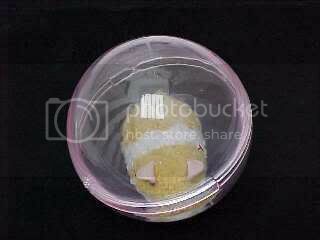 And here's the same little hamster with a technically devasted unroly ball. 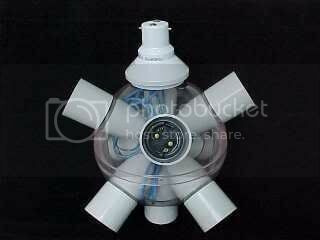 Here's the hamster ball with 9 BC lampholders wired in parallel to a scavenged BC cap off a strobe. And here's a violent high luminosity sputnik type optical devastator fitted with nine 18W CFL lamps (162W total) giving an equivalent light output of 900W. Ouch! 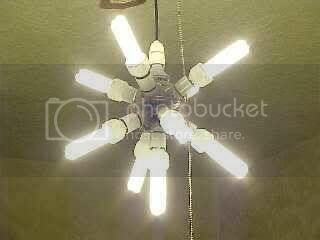 I actually had to remove four of the lamps to bring the light ouput down to a tolerable level, alternatively the device can be fitted with lower output lamps or even a random selection of different compact fluorescent lamp styles, colours and wattages to give an abstract appearance. Obviously for thermal and loading reasons the device should not be fitted with ordinary filament lamps, and care should be taken to ensure that the existing pendant lampholder can accommodate the extra weight.